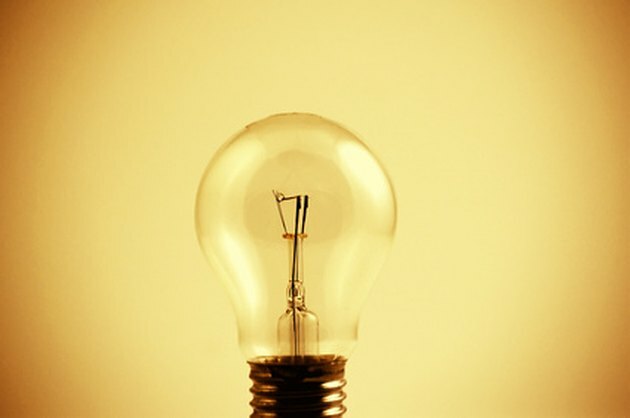 Incandescent bulbs have been around for a long, long time. They are familiar, and give off a light that feels like home. There are some drawbacks to them, though, that are worth considering when compared to other lighting options, such as compact fluorescent bulbs (CFLs). The expense, environmental impact and limited color range of incandescent bulbs may all be a factor as you evaluate your home lighting needs. Incandescent bulbs have some drawbacks. The primary disadvantage of using incandescent light bulbs is cost. They are comparably more expensive to buy and use than CFLs. According to Popular Mechanics magazine, if the average United States household (which has 45 light bulbs) were to switch completely to 75 watt CFLs, the household would save $180 annually on power. You can also save money on the purchase price of the bulb, since CFLs last much longer. An analysis by the Hinkle Charitable Foundation shows a savings of $12.86 for a CFL bulb purchase compared to an incandescent bulb, as the CFL lasts more than 13 times longer than the comparable incandescent. Actual savings may vary due to price and product performance fluctuations. Energy saving is a win-win proposition. Incandescent bulbs require more energy to run. The less energy you use, the less you spend for electricity. The less electricity that is produced (unless you are one of the few households that gets its power exclusively from renewable sources), the less carbon and other pollutants released into the atmosphere. By ratcheting back your electricity usage, you keep these elements out of the atmosphere. If you want specific colors of light to match your décor or for task lighting, your options are limited. Color temperature is the measure of the color of light. The cooler the color temperature, the more red the light. Sunlight has a very high, full spectrum of light. Almost all incandescent bulbs are at the low end of the color temperature scale, and thus produce an orange-like glow. While pleasing, other lighting options like CFL or LED give access to a greater range of color temperature. A CFL bulb can be manufactured to mimic an incandescent, but also to make light higher up in the color temperature ladder, so the light appears a bit bluer and clearer. There are also full spectrum CFLs which, while not as crisp as sunlight, produce a clean light suitable for tasks like sewing or reading.